With spine-chilling heating bills causing worry for homeowners this winter, the answer may be the Slanket. Basically it is a gigantic fleece blanket with sleeves. The Slanket has been designed to keep your entire body covered and cozy while you still retain the use of your hands. Gary Clegg got the idea when he ripped a hole in his sleeping bag so he could change TV channels with his remote control. He got his mother to mock up a prototype and is now ready to share his invention with the world. The US inventor claims the €35 Slanket is both good for the environment and perfect for those suffering through the credit crunch as you will not have to turn your heating on so high. ‘In these new times, we have to be, individually and collectively, a little more creative and conservative with our home heating and gas consumption,’ Gary says. 'We think it is a great idea for everyone to implement into their own lives for their own personal savings, and for the good of the country and earth', he says. 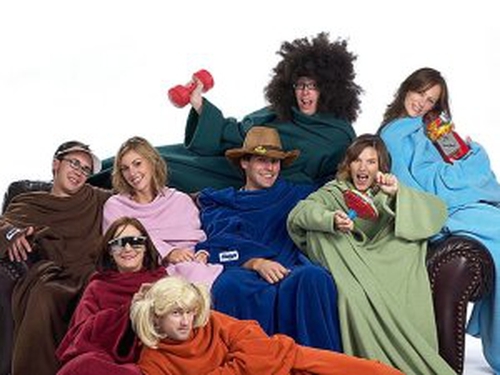 The Slanket, which is available online, has also been road-tested by Gary's parents. ‘You would be surprised the difference it makes, if you lower the temperature only a few degrees,’ his dad Ed commented.